For the American politician, see John J. McRae. Not to be confused with John MacRae or John McCrea. Lieutenant Colonel John McCrae, MD (November 30, 1872 – January 28, 1918) was a Canadian poet, physician, author, artist and soldier during World War I, and a surgeon during the Second Battle of Ypres, in Belgium. He is best known for writing the famous war memorial poem "In Flanders Fields". McCrae died of pneumonia near the end of the war. Author of "In Flanders Fields"
McCrae was born in McCrae House in Guelph, Ontario to Lieutenant-Colonel David McCrae and Janet Simpson Eckford; he was the grandson of Scottish immigrants from Balmaghie, Kirkcudbrightshire. His brother, Dr. Thomas McCrae, became professor of medicine at Johns Hopkins Medical School in Baltimore and close associate of Sir William Osler. His sister Geills married a lawyer, Kilgour, and moved to Winnipeg. McCrae attended the Guelph Collegiate Vocational Institute but he took a year off his studies due to recurring problems with asthma. Among his papers in the John McCrae House in Guelph is a letter he wrote on July 18, 1893, to Laura Kains while he trained as an artilleryman at the Royal Military College of Canada in Kingston, Ontario. "I have a manservant ... Quite a nobby place it is, in fact ... My windows look right out across the bay, and are just near the water's edge; there is a good deal of shipping at present in the port; and the river looks very pretty." He was a resident master in English and Mathematics in 1894 at the Ontario Agricultural College in Guelph. McCrae returned to the University of Toronto and completed his B.A., then returned again to study medicine on a scholarship. While attending university he joined the Zeta Psi Fraternity (Theta Xi chapter; class of 1894) and published his first poems. At medical school, McCrae tutored other students to help pay his tuition. Two of his students were among the first female doctors in Ontario. McCrae graduated in 1898. He was first a resident house-officer at Toronto General Hospital, then in 1899 at Johns Hopkins Hospital in Baltimore, Maryland. In 1900 McCrae served in South Africa as a lieutenant in the Canadian Field Artillery during the Second Boer War (1899 to 1902), and upon his return was appointed professor of pathology at the University of Vermont, where he taught until 1911; he also taught at McGill University in Montreal, Quebec. In 1902, he was appointed resident pathologist at Montreal General Hospital and later became assistant pathologist to the Royal Victoria Hospital in Montreal, Quebec. In 1904, he was appointed an associate in medicine at the Royal Victoria Hospital. Later that year, he went to England where he studied for several months and became a member of the Royal College of Physicians. In 1905, McCrae set up his own practice although he continued to work and lecture at several hospitals. The same year, he was appointed pathologist to the Montreal Foundling and Baby Hospital. In 1908, he was appointed physician to the Alexandra Hospital for Contagious Diseases. In 1910, he accompanied Lord Grey, the Governor General of Canada, on a canoe trip to Hudson Bay to serve as expedition physician. McCrae was the co-author, with J.G. Adami, of a medical textbook, A Text-Book of Pathology for Students of Medicine (1912; 2nd ed., 1914). McCrae later died in 1918 before the end of the war, due to pneumonia and meningitis. His last breath left him in the British General Hospital in Wimereux, France. When Britain declared war on Germany because of the later’s invasion of neutral Belgium at the beginning of World War I (1914), Canada, as a Dominion within the British Empire, was at war as well. McCrae was appointed as Medical Officer and Major of the 1st Brigade CFA (Canadian Field Artillery). He treated the wounded during the Second Battle of Ypres in 1915, from a hastily dug, 8 foot by 8 foot bunker dug in the back of the dyke along the Yser Canal about 2 miles north of Ypres. McCrae's friend and former militia pal, Lt. Alexis Helmer, was killed in the battle, and his burial inspired the poem, "In Flanders Fields", which was written on May 3, 1915 and first published in the magazine Punch. From June 1, 1915, McCrae was ordered away from the artillery to set up No. 3 Canadian General Hospital at Dannes-Camiers near Boulogne-sur-Mer, northern France. C.L.C. Allinson reported that McCrae "most unmilitarily told [me] what he thought of being transferred to the medicals and being pulled away from his beloved guns. His last words to me were: 'Allinson, all the goddamn doctors in the world will not win this bloody war: what we need is more and more fighting men.'" "In Flanders Fields" appeared anonymously in Punch on December 8, 1915, but in the index to that year McCrae was named as the author. The verses swiftly became one of the most popular poems of the war, used in countless fund-raising campaigns and frequently translated (a Latin version begins In agro belgico...). "In Flanders Fields" was also extensively printed in the United States, whose government was contemplating joining the war, alongside a 'reply' by R. W. Lillard, ("...Fear not that you have died for naught, / The torch ye threw to us we caught..."). For eight months the hospital operated in Durbar tents (donated by the Begum of Bhopal and shipped from India), but after suffering from storms, floods, and frosts it was moved in February 1916 into the old Jesuit College in Boulogne-sur-Mer. McCrae, now "a household name, albeit a frequently misspelt one", regarded his sudden fame with some amusement, wishing that "they would get to printing 'In F.F.' correctly: it never is nowadays"; but (writes his biographer) "he was satisfied if the poem enabled men to see where their duty lay." On January 28, 1918, while still commanding No. 3 Canadian General Hospital (McGill) at Boulogne, McCrae died of pneumonia with "extensive pneumococcus meningitis". He was buried the following day in the Commonwealth War Graves Commission section of Wimereux Cemetery, just a couple of kilometres up the coast from Boulogne, with full military honours. His flag-draped coffin was borne on a gun carriage and the mourners – who included Sir Arthur Currie and many of McCrae's friends and staff – were preceded by McCrae's charger, "Bonfire", with McCrae's boots reversed in the stirrups. Bonfire was with McCrae from Valcartier, Quebec until his death and was much loved. McCrae's gravestone is placed flat, as are all the others in the section, because of the unstable sandy soil. A collection of his poetry, In Flanders Fields and Other Poems (1918), was published after his death. Though various legends have developed as to the inspiration for the poem, the most commonly held belief is that McCrae wrote "In Flanders Fields" on May 3, 1915, the day after presiding over the funeral and burial of his friend Lieutenant Alexis Helmer, who had been killed during the Second Battle of Ypres. The poem was written as he sat upon the back of a medical field ambulance near an advance dressing post at Essex Farm, just north of Ypres. The poppy, which was a central feature of the poem, grew in great numbers in the spoiled earth of the battlefields and cemeteries of Flanders. In 1855, British historian Lord Macaulay, writing about the site of the Battle of Landen (in modern Belgium, 100 miles from Ypres) in 1693, wrote "The next summer the soil, fertilised by twenty thousand corpses, broke forth into millions of poppies. The traveller who, on the road from Saint Tron to Tirlemont, saw that vast sheet of rich scarlet spreading from Landen to Neerwinden, could hardly help fancying that the figurative prediction of the Hebrew prophet was literally accomplished, that the earth was disclosing her blood, and refusing to cover the slain." The Canadian government has placed a memorial to John McCrae that features "In Flanders Fields" at the site of the dressing station which sits beside the Commonwealth War Graves Commission's Essex Farm Cemetery. The Belgian government has named this site the "John McCrae Memorial Site". 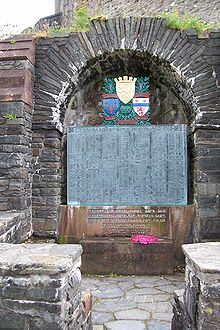 Roll of Honour of Clan MacRae's dead of World War I at Eilean Donan castle in Scotland. "In Flanders Fields" features prominently. McCrae was designated a Person of National Historic Significance in 1946. McCrae was the great-uncle of former Alberta MP David Kilgour and of Kilgour's sister Geills Turner, who married former Canadian Prime Minister John Turner. Marie Christie Geills Kilgour (née McCrae) was sister of John McCrae. In 1918, Lieut. John Philip Sousa wrote the music to "In Flanders Fields the poppies grow" words by Lieut.-Col John McCrae. The Cloth Hall of the city of Ieper (Ypres in French and English) in Belgium has a permanent war museum called the "In Flanders Fields Museum", named after the poem. There are also a photograph and a short biographical memorial to McCrae in the St George Memorial Church in Ypres. In May 2007, to commemorate the 90th anniversary of the writing of his best-known poem with a two-day literary conference. Several institutions have been named in McCrae's honour, including John McCrae Public School in Guelph, John McCrae Public School in Markham, John McCrae Senior Public School in Toronto and John McCrae Secondary School in Ottawa, Ontario. A bronze plaque memorial dedicated to Lt. Col. John McCrae was erected by the Guelph Collegiate Vocational Institute. Colonel John McCrae statue at Guelph Civic Museum, unveiled in 2015 to commemorate the 100th anniversary of his poem "In Flanders Fields"
In May 2015, a statue of McCrae by Ruth Abernathy was erected on Green Island (Rideau River) in Ottawa, Ontario. McCrae is dressed as an artillery officer and his medical bag nearby, as he writes. The statue shows the destruction of the battlefield and, at his feet, the poppies which are a symbol of Remembrance of World War I and all armed conflict since. A copy of that statue was erected at Guelph Civic Museum in Guelph in 2015. The street next to the cemetery where he is buried is named in his honour, although the street is called "Rue Mac Crae". ^ Graves, Dianne (1997). A Crown of Life: The World of John McCrae. Spellmount. pp. 3–8. ISBN 1873376863. OCLC 39342779. ^ "The Early Years". Lieutenant Colonel John McCrae. Veteran Affairs Canada. Retrieved 2008-12-06. ^ A Cyclopedia of American Medical Biography, p. 733. Howard Atwood Kelley. 1920. ^ Graves, Dianne (1997). A Crown of Life: The World of John McCrae. Spellmount. pp. 154–171. ISBN 1873376863. OCLC 39342779. .
^ "Casualty Details Helmer, Alexis Hannum". Commonwealth War Graves Commission. ^ a b Busch, p. 75; Holt, p. 62. Prescott, p. 129. ^ McCrae, Lieutenant-Colonel John National Historic Person. Directory of Federal Heritage Designations. Parks Canada. Retrieved April 24, 2012. ^ Lt. Col. John McCrae, M.D. plaque Archived September 11, 2012, at the Wayback Machine at the National Defence website. Retrieved 2012-03-29. Wikimedia Commons has media related to John McCrae. "In Flanders Fields" museum, Ypres.